I woke up to the voice of Michael, my roommate at the Crystal Inn hotel at about 2 am Tuesday. He was communicating with his colleagues in Lagos where it was 9 am at the time; you know getting some work stuff tidied up. After some ten minutes of trying to go back to sleep, I gave up. My feet hit the ground, I threw on my GAP NYC hoodie and the new pair of sweatpants I bought from the nearby Walmart on Monday evening. Just before stepping out, I informed Michael I was going out to look around. I spent some thirty minutes exploring the hitherto unexplored parts of the hotel. In this time, I discovered the gym, the sauna, the spa pool and the swimming pool; the hotel's full suite of recreational facility. Once I had had my fill of wandering the classically styled hotel interior, I decided to venture into the yonder. The yonder had had me for barely five minutes when I realized things were too cold for comfort. I had covered just about 300 feet along the footpath by the 500-South road in front of the hotel. So hard did the cold hit me that I had to run back all the way to the hotel. I could definitely do with a little more clothing if I was going to explore the area this time of the day. Back in my room, I threw on my woolen head-warmer, woolen gloves and ditched my flip flops for socks and sneakers. This time I was definitely prepared for the worst the midnight chill had to give. 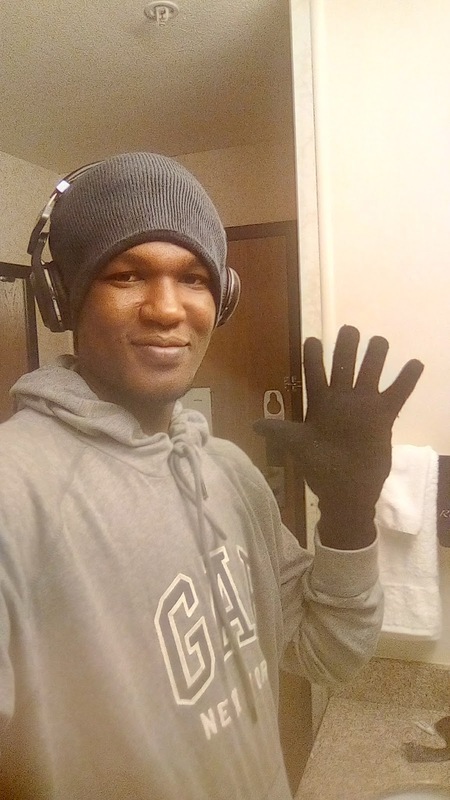 I placed my Bluedio headphones above my head-warmer, turned on the music and hit the road one more time. On my way out, I literally ran into an old lady in the hotel reception who was having a discussion with the reception staff. She turned around to look at me, and once face-to-face with me, she said just one thing: "You look nice"! I was flattered and replied with a wide grin and "thanks". Not many other people were on the roads apart from me. Oh, on my walk I noticed a diner which is just right beside Crystal Inn hotel. I could see into the diner and I swear, with the number of people in there, you wouldn't believe it was 3 a.m. on a Tuesday morning. I walked more or less aimlessly, making turns based on purely instinctual triggers, regulated by good judgement that I had not taken too many turns to lose my sense of direction. On my walk, I passed by the Marriot Hotel and some place called "Janitor's closet". I could not figure out what kind of business is done at the "Janitor's closet". 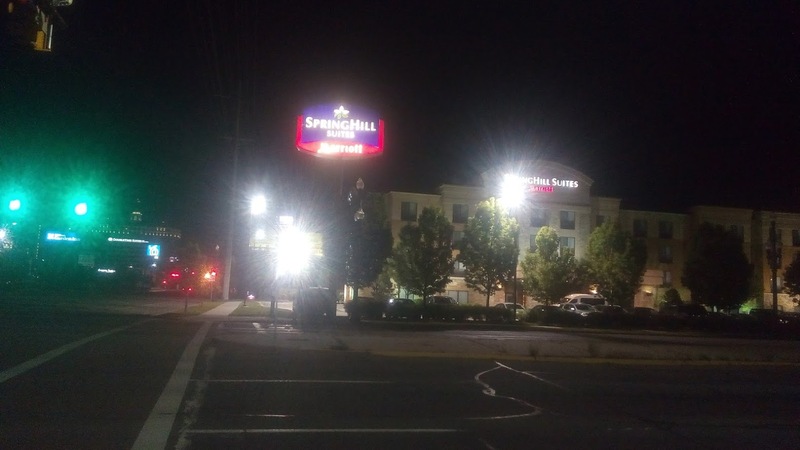 After going full circle around the block on the opposite side of the road as Crystal Inn hotel, it was almost time for me to end my walk. At this point, I took the time out to check out a nearby (to the hotel) bike shop which I had noticed on our way back from Walmart the previous evening. Of course, it was closed (4 a.m.). Nonetheless, I went closer and looked in through the glass to see what they had. In my mind, I was definitely going to return to patronize the bike shop later in the day. But fate had another plan. I was standing at the pedestrian light closest to the bike shop, waiting for the walk signal when I noticed an array of green bicycles, stacked side-by-side on the other side of the road. Immediately, I remembered that yesterday when I'd mentioned my interest in biking to our hosts, Matt (host team member) had mentioned GreenBike. So this was it! 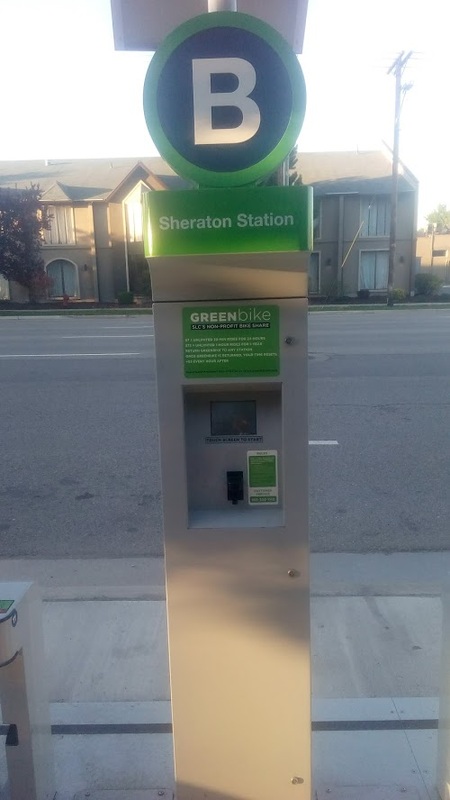 On walk, I crossed over to the other side of the road and walked the few feet to the front of Sheraton Salt Lake City hotel where the bike station stood. The station holds about 20 electronic bike docking stands. Each stand locks one bike in place and is connected to the central computer which has a touch-screen GUI (graphical user interface). I started to register as a new member but after selecting the $7 for 24 hours plan, I realized that I needed a credit card to finalize the subscription. I did not have my card on me, so I had to walk the few hundred feet back to my hotel to get it. Fortunately, I decided to check out GreenBike online after getting my debit card from my second floor room (first floor in Nigeria). I used the free cybercafe at the hotel lobby to access the website and discovered a more affordable $15 for 4 days (24 hours a day) plan which was not on the station computer. I quickly paid for the plan. 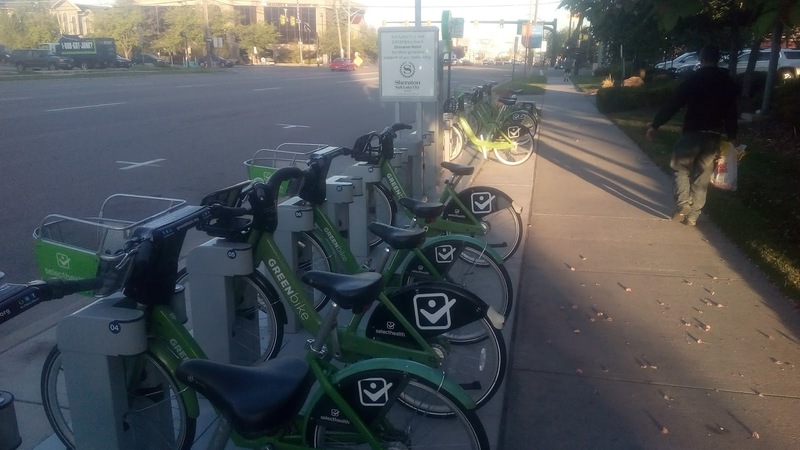 Here, I also found out that the bike must be checked in every thirty minutes to avoid extra charges ($5 per additional hour after thirty minutes from check-in time). 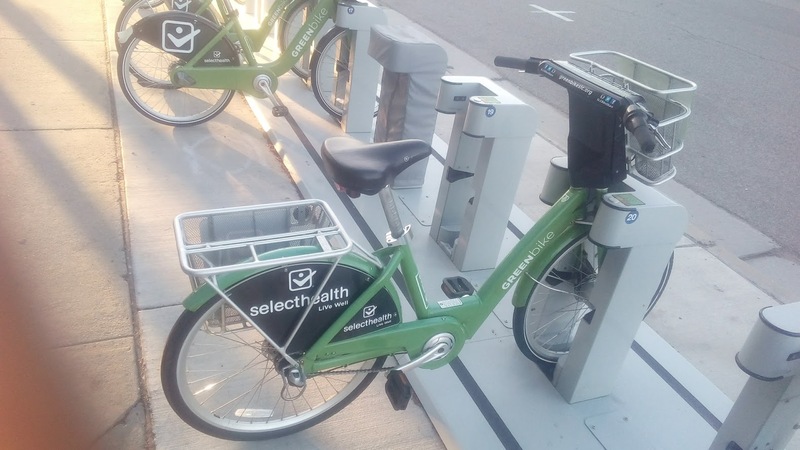 Proceed to the central computer and select "Check out Bike (as existing member)"
Select "Credit card" check-out option. There's the option to check out bike via code sent by SMS to your registration phone number. This didn't work for me; neither did it for Rusty from this post. So, I would just assume that the SMS checkout feature is buggy. 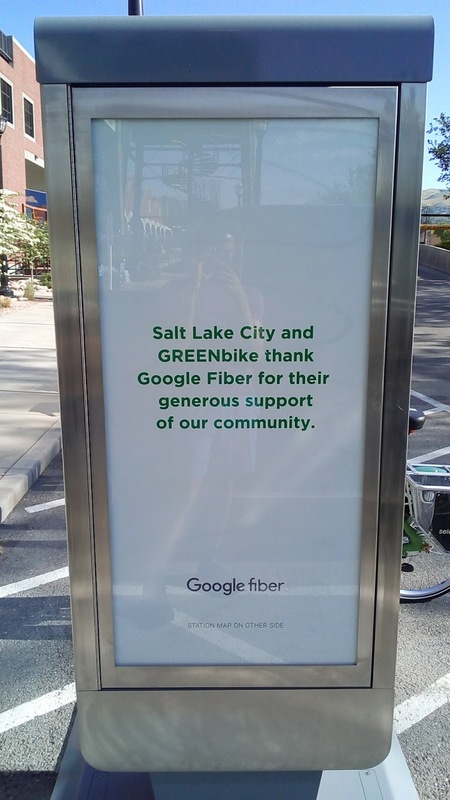 You are now ready to take on your inaugural GreenBike ride. ubiquitous footpaths. Riding a bicycle on any Lagos road that is not a dirt road is unfortunately, a death wish.